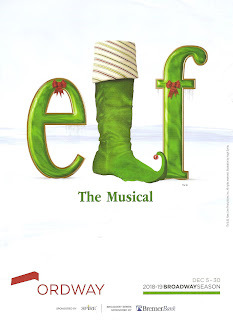 The musical adaptation of the beloved 2003 movie, in which Will Ferrell plays a man-child raised to believe he's an elf, premiered on Broadway on 2010. It's a fairly faithful adaptation; I had just re-watched the movie that day so I recognized some scenes and even lines. To make a two and a half hour long story short, Buddy the Elf (the adorably exuberant Sam Hartley) leaves his North Pole home to find his biological father, a business man in NYC named Walter Hobbs (Joel Stigliano). Mr. Hobbs is less than enthusiastic, having little time for the son he already has. But eventually the family warms to Buddy, who is pure goodness and joy. He ends up working in the Christmas display at Macy's, which is of course more than a job to him. But when Buddy interrupts an important business deal (the Peter Dinklage cameo has been replaced with some predictable business involving a shredder), Walter gets upset and Buddy runs away. Mom (Marie Lemon) and son (Tristan Klaphake) advocate on Buddy's behalf, Walter has a change of heart (a la Scrooge and the Grinch), and they all help Santa when he crash lands in Central Park, thereby saving Christmas! The story is nicely framed by a jovial Santa (Ken Clement) addressing the audience and reading the story of Buddy the Elf, throwing in a few jokes for the grown-ups (Game of Thrones reference!). Despite my general dislike for the movie-turned-musical (give me an original musical any day! ), Elf flows pretty naturally into a musical, because Buddy loves to sing, and we've already thrown disbelief out the window buying into this story of an actual elf. It's already a heightened, magical sort of world, which feels like a natural musical. The music is fun and catchy (performed by a ten-ish-piece pit orchestra under conductor Sean P. Cameron); the highlight being the jazzy "The Story of Buddy the Elf." The score also provides some great character moments, like "Never Fall In Love (with an Elf)" (good advice, that), belted by Mackenzie Lesser-Roy's Jovie, the less than Jovial elf whom Buddy befriends. The entire 20+ person cast does a wonderful job playing multiple characters and dancing festively, either on their feet or knees as the elves. The set (designed by Christine Peters) is a two-dimensional winter wonderland, and also represents the greatest city in the world (NYC, obvs) as a thing of cartoonish dreams. 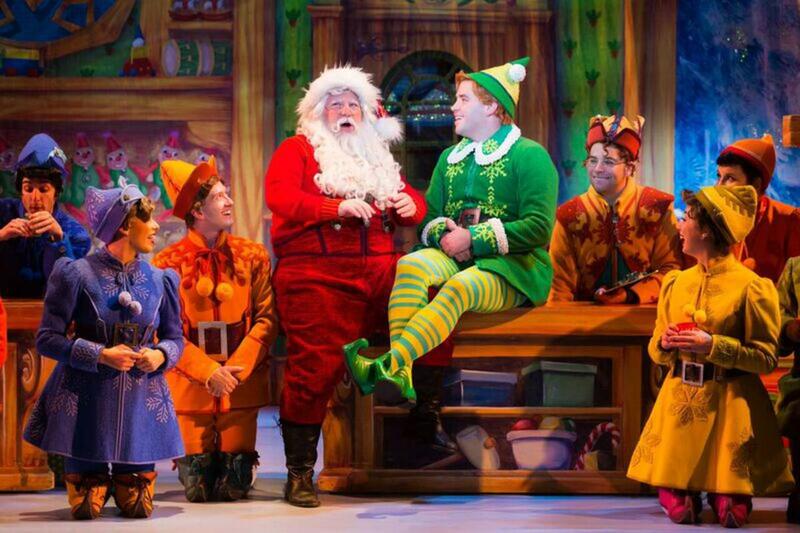 Costumes (designed by Gregg Barnes) are colorful and very elf-like, creating a fun and festive atmosphere on stage. 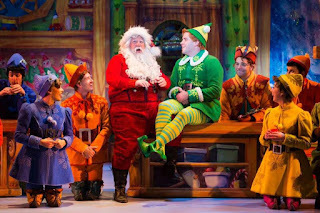 Elf the Musical is a wonderful story of believing in magic, but the magic I want to see more of on the Ordway stage is that created by our fabulous #TCTheater artists.